A Scene from ‘Everyday Life’: Two Ladies with their Cavaliers Beside a Fountain. Pen and brown ink and wash, within brown ink framing lines. Signed: Domo Tiepolo f. 375 x 506mm. 14 ¾ x 19 ⅞in. PROVENANCE: S. H. Weathrall King, part of a group of Giandomenico drawings sold, Sotheby’s, London, 11 November 1965, lot 25, £4,000 to Regina Shoolman Slatkin; Vincent Price; Mrs Douglas Williams. EXHIBITED: New York, Metropolitan Museum of Art and The Morgan Library, Drawings from New York Collections, The Eighteenth Century, 1979, cat.266. LITERATURE: D. Succi, ‘Ironia e delizia comica’, I Tiepolo. Virtuosismo e ironia, exhib. cat. Mirano, Barchessa -Villa, XXV, no.46; G. Pavanello, ‘Tutta la vita dal principio alla fine è una comica assurdità’, Tiepolo: ironia e comica, Fondazione Giorgio Cini, 2004, p.41; A. Gealt and G. Knox, Giandomenico Tiepolo: Scene di vita quotidiana a Venezia terraferma, Venice 2005, p.141, no.45. This magnificent sheet belongs to Giandomenico’s elegant depictions of scenes from contemporary Venetian life, his masterpieces of invention, style and draughtsmanship which date from the early 1790s. The series is a unique evocation of Venetian society and the present example belongs specifically to the group known as la villeggiatura, variations on the theme of fashionable excursions in and around Venice. Here, Giandomenico presents his figures, decoratively dressed, enjoying the gardens of a simulacrum of Palladio’s Villa Rotunda. 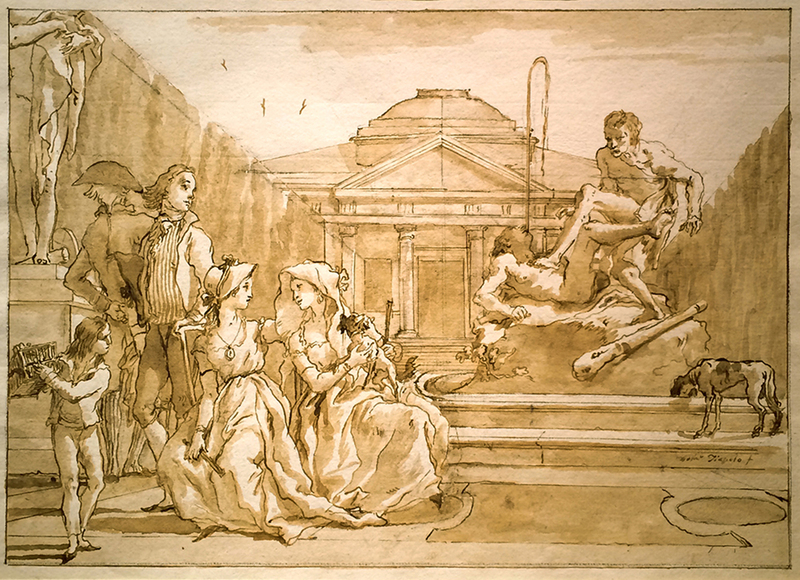 With its garden setting depicting a group of two women and two men by a sculpture, this work is described as having a pendant in another drawing from the same series entitled In front of the Statue of Acteon; dogs again form part of the company and the figures are dressed in a very similar way, particularly the women with their matching hats. The architecture and the straight lines of the box hedges forming an enfilade make the setting more formal in the present work but the brutal fight depicted in the sculpture and the dog with its head in the fountain add characteristically earthy touches. Giandomenico very often repeats motifs in his drawings and from the present drawing, the figure of the lady seated on the left, turned in profile with one arm raised, reappears in an example from the Divertimenti Veneziani entitled La bottega del caffè and in another known as Conversazione con pappagalli, while the two statues, the Hercules and Antaeus and the section visible of a sculpture of a standing draped figure on the left hand side both recur in other sheets1; the villa itself can be seen again in a slightly more vertical manner in one of the grand drawings from the important series of Biblical drawings, dating from 1786-1790, Jesus Rebukes the Unclean Spirit, a sheet which is now in the Louvre2. Giandomenico was in his mid sixties when he made this drawing and the whole extraordinary series to which it belongs. The Biblical series had formed his first huge undertaking after retiring from life as a painter of grand decorative projects. Where the Biblical drawings are all vertical in format, the Scenes from Contemporary Life are all horizontal but on similarly large sheets of fine paper, drawn within framing lines. A third important series of such highly finished. narrative drawings, on the life of Pulcinella, entitled Divertimento per li regazzi, belongs to the next decade. There is no indication that the Contemporary Life drawings were commissioned, nor that they were intended to be published as engravings and we do not know when and by whom they were first dispersed; only that they began to appear in sales towards the end of the 19th century, the first of which was the sale of parts of the collection of Louis August, baron de Schwiter in 1883. A small number of the scenes bear some relation to the frescoes painted by Giandomenico in the Villa Tiepolo at Zianigo, to where Giandomenico had moved more permanently in 1785 and this project may have been the inspiration for the series. There are thirteen surviving sheets in the section devoted to La Villeggiatura, which rather than depicting any kind of rural pursuits such as hunting or harvesting, focus on the pleasures of high society, walking and conversing in villas and gardens, a theme which Giandomenico made very much his own. Unlike some scenes from the Contemporary Life series, there is no element of caricature or exaggeration in the Villeggiatura drawings, the figures are elegant, modish and, more often than not, youthful. 1. See A. Gealt and George Knox, op. cit., 2005, under cat.45, and also cats.44, 65 and 80 and James Byam Shaw, The Drawings of Domenico Tiepolo, London 1962, p.94. 2. See, A. Gealt and George Knox, Domenico Tiepolo A New Testament, Indiana, 2006, cat. 143.